Toshiba’s Digital Products Division (DPD), a division of Toshiba America Information Systems, Inc., today announced U.S. retail pricing and availability for the Qosmio® X770 and Qosmio X770 3D series of high-performance laptops. Most ideal for demanding visual tasks like gaming and media creation, these laptops feature a high-performance blend of processor technologies from Intel® and NVIDIA®, while delivering ultra-fast components, entertainment-focused features and 3D technology for consumers looking for maximum mobile performance. Starting at $1,199 MSRP1, the Qosmio X770 and Qosmio X770 3D Series are available at participating retailers later this month. Qosmio X770 laptops are equipped with powerful processors, ultra-fast components and latest-generation technologies to meet the needs of consumers demanding more performance from their portable PC. One of the first laptops to feature the NVIDIA® GeForce® GTX 560M graphics processor2 with 1.5GB of discrete graphics memory3 plus battery-saving Optimus™ technology, the Qosmio X770 is able to handle demanding DirectX® 11 games with ease while delivering plenty of performance for media creation apps. Offering a choice of 2nd Generation Intel® Core™ i5 or i7 processors4, configurations are available with up to 8GB RAM3, plenty of ports, including a USB 3.0 port5, plus hard drive storage options scaling up to 1 terabyte6. Featuring a 17.3-inch diagonal HD+ TruBrite® LED backlit display7, the Qosmio X770 features built-in premium harman/kardon® speakers and subwoofer tuned with sound enhancement technologies from Dolby® and MaxxAudio 3 by Waves Audio. Dressed in a premium Fusion® X2 finish and a raised-tile keyboard enhanced with red LED backlighting, the Qosmio X770 delivers distinctive and durable styling that is sure to turn heads. The laptop features a full range of Toshiba “Smart” features, including USB Sleep & Charge8 and Toshiba Sleep & Music, enhancing the laptop’s capabilities to power up smartphones and sound to MP3 players while powered down. Additional configuration options include a Blu-ray Disc™ player9 and Bluetooth v3.0. The Qosmio X770 3D, featuring NVIDIA 3D Vision™ technology10, offers full stereoscopic 3D entertainment for gaming, movies, photos and more. Featuring a 17.3-inch diagonal 120Hz 3D-ready, 1080p HD TruBrite LED backlit display7, this laptop includes a pair of wireless active shutter glasses for out-of-the-box 3D enjoyment, plus essential components for Blu-ray 3D playback, 2D-to-3D movie conversion, plus output to a 3DTV, the Qosmio X770 3D delivers a full suite of 3D enjoyment. Offering the same high-end processors, components and styling featured in the Qosmio X770, the Qosmio X770 3D maxes out the platform even further with a 1.25 terabyte hard drive6 with Hybrid Drive technology, plus a Blu-ray Disc™ Rewriteable drive9. The Qosmio X775 3D carries as MSRP of $1,899.99 MSRP1. 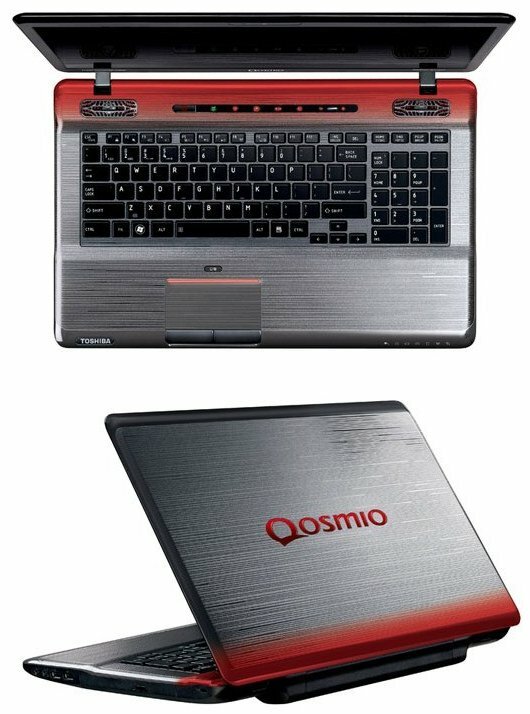 The Qosmio X770 Series starts at $1,199.99 MSRP1 and will be available later this month at major retailers, e-tailers and direct from Toshiba at ToshibaDirect.com.